Californians again earned good grades for water savings last month, cutting overall urban use by 31 percent compared with July 2013, officials said Thursday. As The Californian reported earlier, Bakersfield’s numbers were mixed, with California Water Service Co. customers far exceeding their 32 percent mandate but city of Bakersfield ones again missing their 36 percent mark. It remained unclear Thursday what repercussions the city may face. State officials said they will be reviewing data in coming weeks and telling water agencies with poor track records what they may need to do. Those officials were happy with the overall state numbers, but stressed the need for continued conservation. To reach the goal of a 25 percent reduction in overall statewide urban water use, the state board assigned water districts individual targets requiring them to cut local consumption by as much as 36 percent compared with 2013 levels. In June —- the first month the targets were in effect —- statewide use fell by 27 percent. Last month’s even bigger water savings were undoubtedly boosted by rare summer storms. About a third of an inch of rain fell in downtown Los Angeles, breaking a record for July precipitation that had stood since 1886. Despite the good report card, some urban water districts have fallen well short of their targets. In June, 16 suppliers missed their goals by 15 or more percentage points. Last month four districts fell into that category. None is in Kern County. Locally, Cal Water Bakersfield customers made a dramatic cut, using nearly 39 percent less water last month than in July 2013. But several other local water agencies missed their targets. 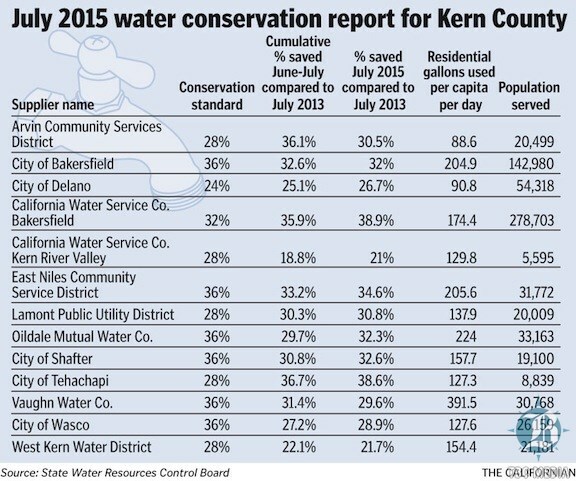 Bakersfield city water users, primarily in the southwest, consumed 32 percent less water than in July 2013. East Niles Community Services District consumers used 34.6 percent less. Oildale Mutual Water Co. users consumed 32.3 percent less water, while Vaughn Water Co. customers cut usage by 29.6 percent. The state had ordered each of those agencies to make 36 percent cutbacks. The West Kern Water District was mandated to reduce usage by 28 percent — but achieved less than a 22 percent cut and requested an alternative compliance order from the state because so much of its usage is tied to power plant and oil operations. State officials said Thursday they were still reviewing requests from West Kern and other agencies. Those that repeatedly get a bad report card face potential state fines of as much as $10,000 a day. “We’ll reassess next month and if any of the purveyors are falling into the higher categories, we’ll be meeting with them and issuing compliance orders as needed,” said Cris Carrigan, chief of the water board’s office of enforcement. ”We don’t want to see reversing trends,” he said. But water agencies face another challenge besides mandated monthly reduction targets. Agencies’ cumulative water use must also meet their monthly reduction targets — meaning they must save more water to make their cumulative totals rise. Bakersfield’s water system, for example, has cumulatively produced nearly 33 percent less water since water reductions began to be enforced two months ago — short of its 36 percent target, according to Water Resources Director Jason Meadors. “We need to make that up, we know. We’ll have to reduce water consumption over the next few months to catch up,” Meadors said. To do so, Meadors said, city water users may have to cut their usage by approximately 40 percent in August to drop their cumulative reduction to 36 percent. With this in mind, Water Resources Department officials are reviewing an Aug. 11 warning letter from Carrigan, which recommended considering steps including further reducing watering days, increasing staffing and budgets for water conservation, imposing fines and finding system leaks. Bakersfield’s water resources department has already added two staffers to assist with conservation, and the city has spent more than $1 million to plug system leaks over the past year, Meadors said. Water resources staffers are discussing other options — including fines, although talk of fines hasn’t gone too far. “We’re doing a lot of stuff we didn’t do previously,” Meadors said, adding it was too soon to know which, if any, options could be presented to the city water board Sept. 9. Oildale Mutual Water Co. also missed its mark in both June and July. General Manager Doug Nunneley said he’s not proposing any new drastic mandates as a result of the new numbers, just continuing to educate customers on the need to conserve and doing more water patrolling at night. It’s reviewing a letter from the state suggesting ways to improve, he said. Oildale has one big thing in its favor: Its July numbers were much better than its June ones. Nunneley said it’s tough for Oildale Mutual to post big conservation gains because it has had savings programs similar to what the state imposed this year for decades. There’s also the weather, he said. Given that outdoor irrigation accounts for 80 to 85 percent of people’s residential water use in the summer, Nunneley is concerned it will get harder to meet the state standards in cooler months when that drops to more like 40 percent. One thing people can do, in addition to curtailing water use indoors, is not planting winter rye, Nunneley said. “If they don’t plant it and we avoid all of that landscape (watering), we may be able to meet the standard with just that,“ he said. Theo Douglas and Christine Bedell of The Californian and The Los Angeles Times contributed to this story.